A Kisumu lobby group that secured temporary orders stopping implementation of 16 percent VAT on fuel has now sued the Energy Regulatory Commission (ERC) and Treasury for contempt. The petitioners, Sumawe Youth Group, have sued ERC Director-General Pavel Oimeke and National Treasury Cabinet Secretary Henry Rotich. Justice Fred Ochieng of the Kisumu High Court on Tuesday certified the matter as urgent and ordered the petitioners to serve the two respondents and the attorney-general. The case will be mentioned on September 12, the same day the case filed in Bungoma will be heard at the Kisumu High Court. On Tuesday, lawyer Ken Amondi for the petitioners told Justice Ochieng that immediately Justice Riechi of Bungoma High Court gave orders, they duly served ERC. "The ERC director has confirmed in the press that he has knowledge of the order through scanned copies," said Mr Amondi in court. On Thursday last week, Mr Amondi told the Nation that both Treasury and ERC had rejected service of the scanned orders, insisting on getting the original ruling. The advocate fought ERC's and Treasury's demands for the original copies in court. "That is enough my Lord, they ought to have implemented orders of the court, because they have confirmed receiving them." Mr Rotich last week directed the Kenya Revenue Authority and ERC to effect the tax despite a parliamentary vote which postponed the levy by two years. 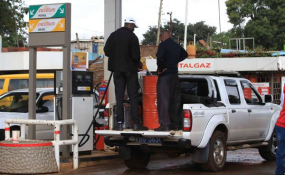 The move elicited sharp reactions from Kenyans, with fuel distributors suspending operations, which saw many petrol station across the country ran out of the essential product. Some politicians also called for the resignation of Mr Rotich for disrespecting Parliament. But as the court duel continues, all eyes are now on President Uhuru Kenyatta to see if he will sign into law the Bill. Mr Kenyatta has less than two weeks to make up his mind.